alaTest ha raccolto ed analizzato 57 recensioni su Motorola Photon 4G MB855 / Motorola ELECTRIFY. La media della valutazione per questo prodotto è 3.7/5, confrontata con la media della valutazione di 4.3/5 per altri Cellulari. I commenti su qualità fabbricazione e design sono generalmente positive. In aggiunta, schermo e usabilità ottengono buone opinioni, tuttavia vi sono alcune valutazioni critiche circa la fotocamera. Abbiamo analizzato differenti valutazioni di esperti ed utenti, età del prodotto ed altri elementi. A confronto con altri Cellulari, Motorola Photon 4G MB855 / Motorola ELECTRIFY ha ottenuto un alaScore™ complessivo di 82/100 = qualità Molto buono. Editors' note: In this review, we'll focus more on the Motorola Electrify's different features and performance. For more information on the smartphone, including design and user interface details, please read our review of the Motorola Photon 4G . 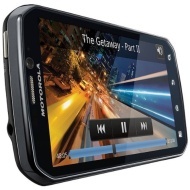 The Motorola Electrify boasts a dual-core processor, a 4.3-inch qHD display, and world-roaming capabilities. The Android Gingerbread handset also has an 8-megapixel camera, HDMI port, and built-in kickstand. Motorola's custom user interface isn't for everyone. The handset is on the larger side. Camera quality wasn't that great. The Motorola Electrify is a great Android device for U.S. Cellular customers seeking power and the latest and greatest in smartphone technology. The Motorola Electrify is U.S. Cellular's best smartphone, with a fast dual-core processor and gorgeous 4.3-inch screen. Awesome phone! Very user friendly. Best phone I've owned yet, and would highly recommend it! Fast, tons of memory, great call quality, and very classy looking. I've read that the camera is "average" and am finding this to be true, but then, I didn't buy it for the camera so it doesn't bother me. Best phone a U.S. Cellular customer could have for a busy life of checking updates, connecting with friends and browsing the web. The large screen is great, I love being able to just push one button instead of like 5 in one! Dual Core processor lets the phone think twice! It's also a fast internet surfer, Facebook, Twitter, and YouTube loads in a snap! 8MP Camera has a little work ahead of it! Wi-Fi- connector has a hard time connecting though a wall. "Solid performer with lots of memory." Excellent call quality and speaker phone. Solid performer with lots of memory. Excellent call quality and speaker phone. Kickstand makes viewing videos a plus. Bloatware is easy to remove. Tons of memory should make updates a breeze. Camera average. Motorola UI is a plain jane. Not as fast as loading as "dual core" would make ya think.